It is no coincidence that this year, Los Angeles’ largest Labor Day march will begin in front of Ramon Cortines High School. The popular narrative is that labor unions and public schools are on opposing sides; that somehow addressing issues of wages, hours, and working conditions is at odds with putting kids first. But union workers have been challenging that notion for years. Take, for example, the members of SEIU Local 99. They are the school cafeteria workers, bus drivers, special education assistants, custodians, and others who provide essential student services at LAUSD. SEIU Local 99 members’ connection to their schools goes far beyond work. More than 50 percent of these school workers are also parents of children attending LAUSD schools. A majority — more than 75 percent — are also graduates of LAUSD schools. Their commitment to their neighborhood schools and the students they serve is deep and personal. And it’s that commitment that fuels their activism as union members and their deep desire to ensure all students have access to a quality public education. SEIU Local 99 members led the fight to preserve and expand Breakfast in the Classroom and after-school supper programs because they know that, for many students, school meals are often their only meals of the day. They negotiated the breakthrough $15/hour minimum wage at LAUSD that created a pathway out of poverty for thousands of families. Union members also supported initiatives to expand wellness clinics in our schools. We’ve been an active voice for immigration safe zones and were the most visible “boots-on-the-ground” to ensure the passage of Propositions 30 and 55 which secured state funding and stopped devastating cuts to education. It is impossible to disconnect the needs of students from the goals of labor. We’re currently in contract negotiations with LAUSD, and every one of our bargaining priorities aims to increase supports for the students we serve. Special education assistants, for example, are leading the fight to stop a cut of nearly 80,000 hours that will severely disrupt the care and support they provide to some of the district’s most vulnerable students. Custodians are also advocating for staffing levels that will ensure cleaner, healthier schools. The district has not restored many of the custodial positions that were lost during the Great Recession. By LAUSD’s own admission, custodians are only staffed at roughly 40 percent of the levels needed to meet the district’s cleaning standards. Many custodians worry that this severe understaffing has led to the shuttering of school bathrooms and other cost-cutting measures that are creating a health hazard for students. Community representatives, who are key to parent engagement in our schools yet are limited to part-time status, are advocating for increased work hours that will allow them to help more parents with everything from understanding how to better prepare for their child’s academic success to assistance with deeply personal issues like domestic violence. Wages are, of course, a key part of contract bargaining. But as parents and workers who live in the communities where we work, fighting for fair wages is all about ensuring students have the stability at home that they need to succeed in school. As parents, SEIU Local 99 members are trying to put food on the table for students. They’re trying to keep a roof over students’ heads and clothes on students’ backs and save for students’ higher education. They are trying to do this on low wages, few hours, and patchy healthcare coverage. Classroom lessons are important, but a child is not ready to learn if she lacks clothes or food or shelter. As the second-largest employer in Los Angeles County, we believe LAUSD can go a long way to ensure economic equity for our families and communities — and the children we serve. So this Labor Day, yes, we’ll be marching for fair wages, better staffing, and good jobs. We’ll be marching because we can’t push for academic achievement in schools that can’t be kept clean. We’ll be marching because you can’t promote parent partnerships and not staff the very programs that help schools and parents connect. We’ll be marching because we can’t aim for 100 percent graduation only to have many of those graduates head into jobs that pay poverty wages. We’ll be marching because these “labor issues” are our children’s issues. Max Arias is the executive director of SEIU Local 99: Education Workers United. 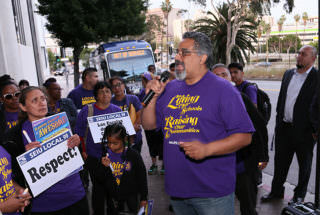 Nearly 30,000 SEIU Local 99 members work at LAUSD.